The Catchments Remediation Rate (CRR) is a special rate paid by Hornsby Shire residents to fund projects that repair and protect local waterways. 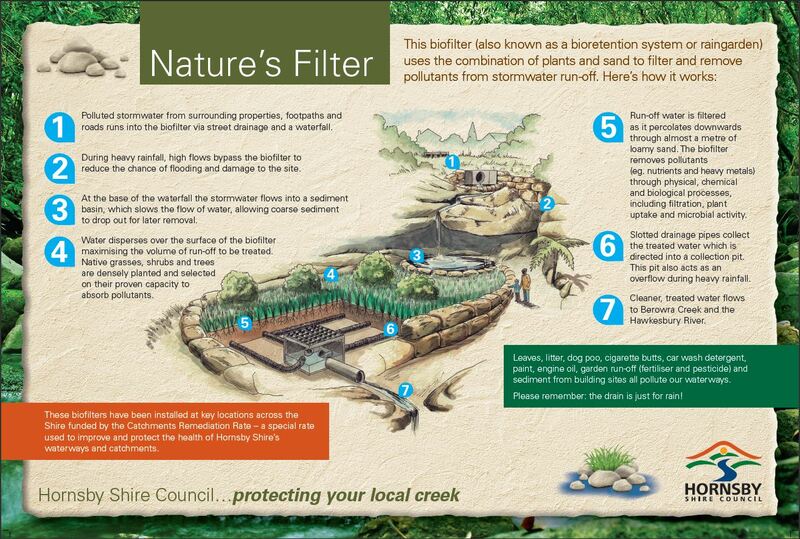 The Catchments Remediation Rate is levied at five percent of Council’s ordinary rates and raises $3 million each year that is used to install and maintain stormwater quality improvement devices within the Shire’s four major catchment (drainage) areas: Berowra Creek, Cowan Creek, Upper Lane Cove River and Hawkesbury River. Why is the rate needed? The 1970s and 1980s saw the increasing urbanisation of Hornsby’s sensitive bushland catchments and an influx of tens of thousands of new residents. Sediment runoff from developing and newly developed residential areas and nutrient pollution from sewage treatment plants contributed to the deteriorating quality of local creeks and estuaries. Unsavoury smells from the natural waterways became more potent and more common; algal blooms were becoming more substantial and more frequent; run off and sewage overflows in wet seasons became more difficult to manage; frog watchers noted the loss of familiar species; recreational fishermen caught fish with black livers; bush walkers watched weeds intrude into relatively pristine natural reserves; indigenous plants died or were depleted by theft; and locals watched the sea grass retreat under increasingly muddy water. By the 1990s it was clear that Hornsby Shire’s waterways were under severe stress. Berowra Creek was being despoiled by instances of fish kills and algal blooms. Urgent action was needed. How did the rate come about? To force the State Government to see how desperate the situation was Hornsby Shire Council placed a moratorium on the processing of any development application located within the West Hornsby Sewage Treatment Plant’s catchment area until action was taken. The strategy worked and in April 1994 a Statement of Joint Intent (SoJI) was signed between Hornsby Shire Council, NSW Government, Environment Protection Authority, (Sydney) Water Board and the Hawkesbury-Nepean Catchment Management Trust. 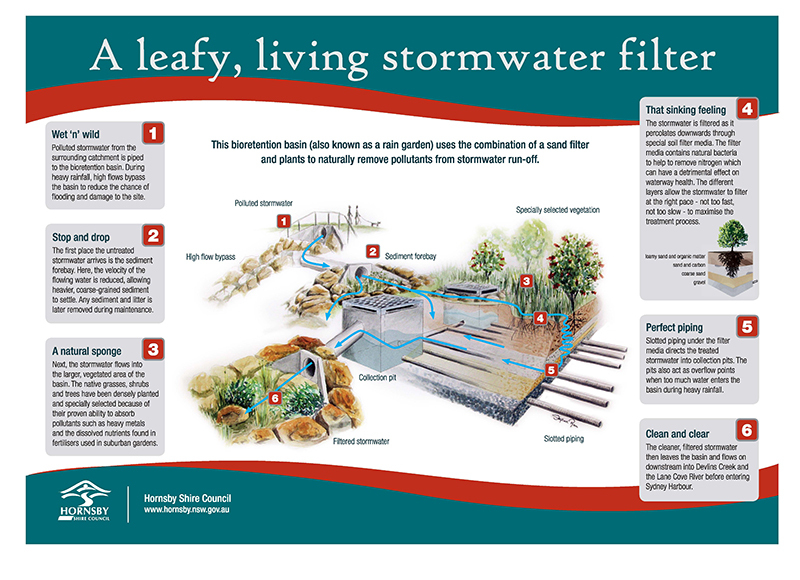 The principle intent behind this “community contract” was the ecologically sustainable development of Berowra Creek catchment and recovery of the environmental health of the Creek. 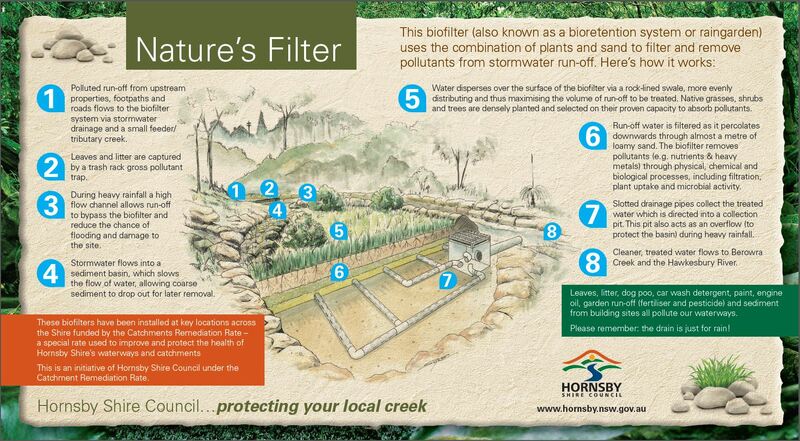 The SoJI not only acknowledged the significant impacts of polluted urban stormwater run-off but instigated the upgrading of the West Hornsby and Hornsby Heights Sewage Treatment Plants (reducing nutrients through increased levels of wastewater treatment) and the creation of the CRR. What projects does the CRR fund? 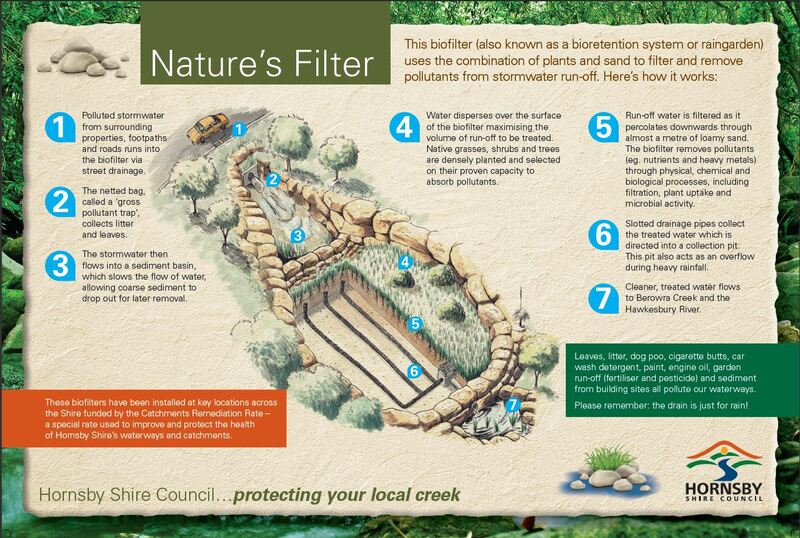 Biofilters (also known as Bioretention Basins or Raingardens) – vegetated sand filters that trap litter, remove sediment and filter out pollutants such as nutrients and heavy metals. 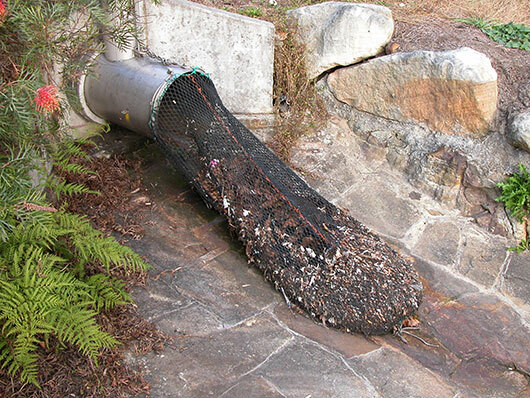 Gross pollutant traps – a range of rubbish racks, baskets, nets and other infrastructure that remove litter, leaves and sediment from stormwater runoff. Continuous Deflective Screening (CDS) devices – underground concrete chambers that screen stormwater by using a vortex action to capture pollutants. Graduated trash racks - angled screens that use streamflow velocities to capture organic matter and gross litter pollution. 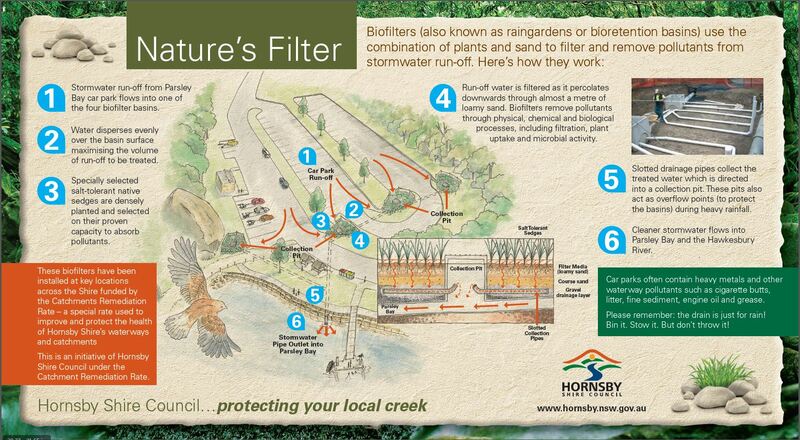 Sediment basins – trap sediment from stormwater preventing it entering waterways. 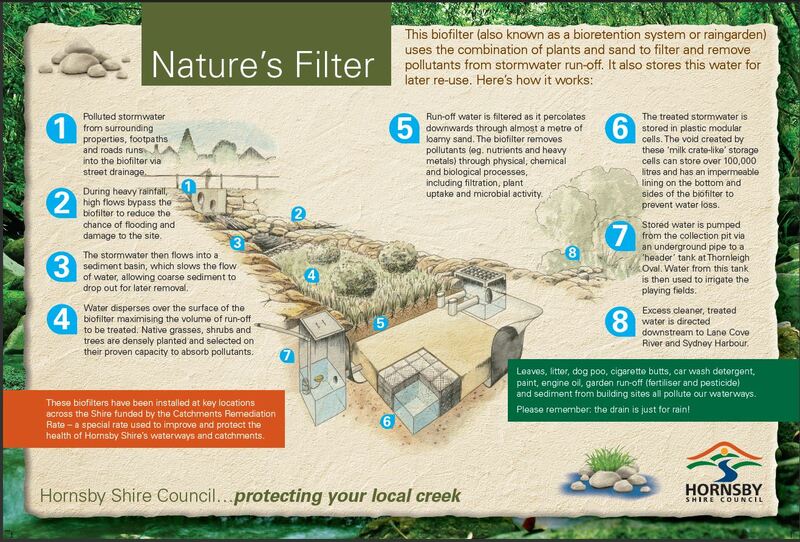 Artificial wetlands – similar to sediment basins but generally larger and vegetated by native aquatic plants. 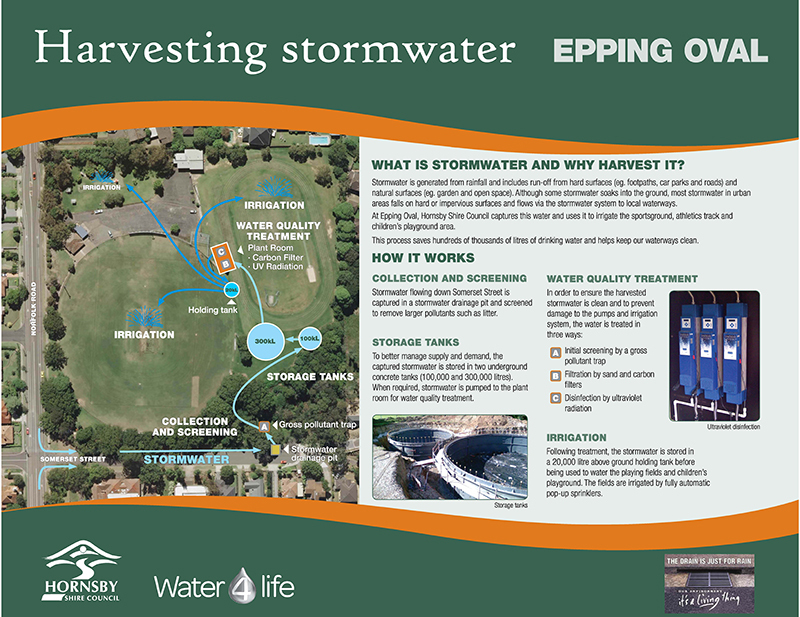 Stormwater harvesting schemes – collect stormwater runoff to be reused for irrigation on playing fields and ovals. Leachate treatment facilities – treat polluted leachate from two of the Shire’s former tip sites at Arcadia Park and Foxglove Oval. 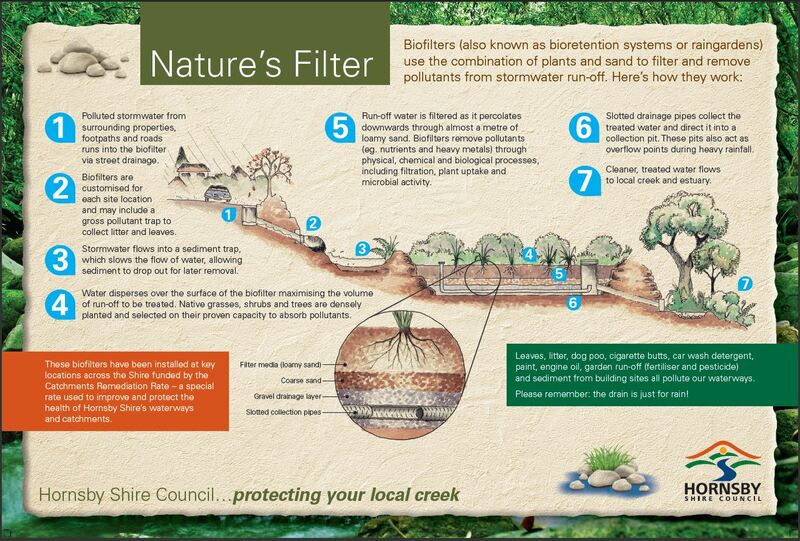 Creek remediation works – the stabilisation of creek and drainage lines to prevent further erosion. Two biofiltration basins have been constructed at: Pennant Hills Park and Asquith Oval, Asquith. Four biofiltration basins are scheduled for construction at: Lessing Park, Hornsby; Cawthorne Street, Hornsby; Holliday Road, Berowra and Orara Road, Waitara. 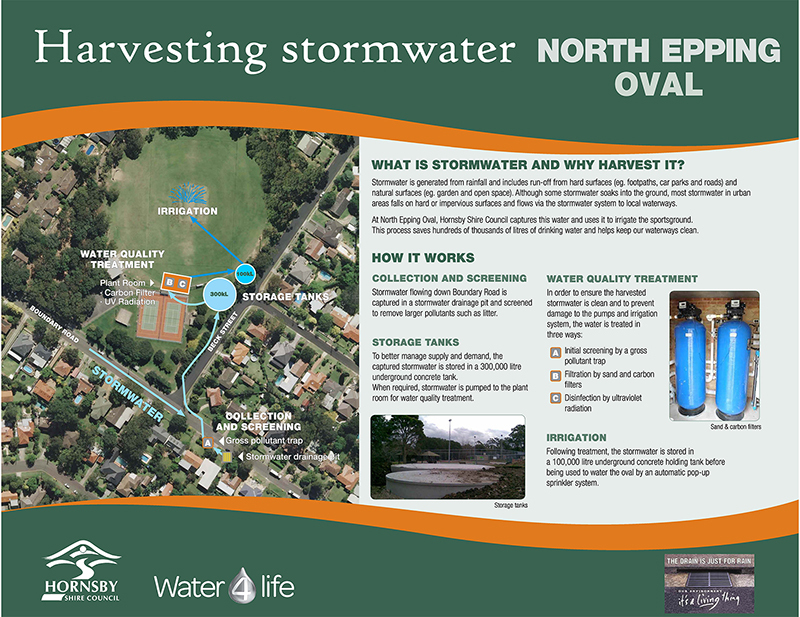 Three stormwater harvesting facilities are scheduled for construction at: Asquith Oval, Rofe Park and Waitara Park. Two gross pollutant traps are scheduled for construction at: Morrison Place, Pennant Hills and Oorin Place, Hornsby Heights. Two graduated trash racks are scheduled for construction at: Mittabah Road, Asquith and Chiswick Place, Cherrybrook. What else does the CRR fund?